Have you ever wondered what’s happening to etiquette and manners in society? Is it the responsibility of the parent? The university? The individual? I think it’s a good mix of “all of the above”. I’ve noticed a lot recently that people in general seem to have completely forgotten about their manners and appropriate etiquette. This topic could really go into some great depth, but I’ll focus on just a few points (look for another post soon). When someone asks a question, it’s good manners to reply with a “yes” or “no”. To go one step farther, you could add formality and address the person as “ma’am” or “sir”. It sounds simple, but you’d be surprised how many times you can catch yourself saying “yeah” or “yep”. I was summoned for jury duty last week and in the process, the entire group was questioned by a judge. I can’t believe how many people addressed the judge with “yeah”, “nope”, etc. There were even a few that added snide comments that were completely unnecessary and unsolicited. Look around and be observant. This could be as simple as opening a door for an elderly person or someone with a disability (or simply to be nice!). I’m notorious for looking at my cell phone more than my surroundings, completely immersed in email or a phone call. If you’ll look up once and awhile, you’ll find plenty of ways to help others in need. Sure, they could do it themselves with some difficulty, but wouldn’t it be nice if you could assist? In this hectic world where everything is GO-GO-GO, we sometimes forget the little things like please and thank you. A good friend of mine reminded us of this in a recent blog post, Saying Thank You. It’s more than saying please and thank you. It’s also about saying “you’re welcome” instead of “no problem”. How does this relate to job seekers or those already employed? Well, you want to make a positive impression in the interview, on the first day of your new job and going forward, right? Start with these three things. It’s all about respect and etiquette. Please feel free to add your comments below. If you’re not already a subscriber of Campus to Career, you can fix that by clicking the “subscribe” button at the top of the page. 🙂 Also, we’re on Facebook. As always, thanks for reading! I’m a HUGE fan of saying “You’re Welcome” as opposed to “No Problem”. “No Problem” implies that it could be a problem. “You’re Welcome” implies “It’s My Pleasure”. “No Problem” is a more appropriate response to “I’m Sorry” instead of “Thank You”. Thanks for the comment, Cindy! I appreciate it! Excellent reminder! 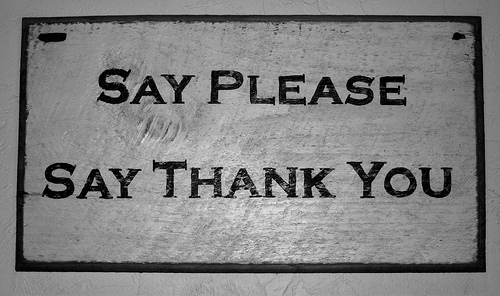 Manners seem to be a lost art these days. Great post! Thanks for the comment. I appreciate your participation!